Somewhere in the cosmos there must be an alternate universe in which Ace Frehley is huge. Face it, the Space Ace was always the coolest member of Kiss, and although he could never claim to be the best guitarist or the best singer in the world, face it, the Space Ace was always the coolest member of Kiss. Which is no bad thing in itself. 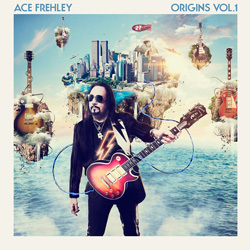 Frehley’s latest offering is a set of twelve covers from his formative years – although a quarter of them come from the Kiss back catalogue – with a handful of special guests along for the (rocket) ride: Paul Stanley sings ‘Fire And Water’ and John 5, Slash, Lita Ford and Mike McCready pop up on ‘Spanish Castle Magic’ and ‘Parasite’, ‘Emerald’, ‘Wild Thing’, and ‘Cold Gin’ respectively. It’s hard to be objective about covers albums because if for example, you deified the aforementioned ‘Fire And Water’ back in the day you’re not going to be too happy with a couple of oiks from New York trying to put their stamp on it (despite the fact they actually perform it rather well). Still, Frehley and his companions do at worst a workman like job of executing the material chosen for ‘Origins Vol.1’ and opener ‘White Room’ – originally recorded by Cream in 1968 – sounds as fresh as a daisy while ‘Bring It On Home’ is a full-on guitar fest. And The Frehley/Ford romp through ‘Wild Thing’ is guaranteed to put a smile on your face. But where this album really shines is on the three Kiss compositions. ‘Parasite’ always was as heavy as a box of spanners anyway, and this version is a barrel-chested pugilist. ‘Cold Gin’ both bites and barks in equal measure, and album closer ‘Rock And Roll Hell’ s an extended work-out which channels its aggression through Frehley’s guitar histrionics and makes the point that maybe, just maybe, the ‘Creatures Of The Night’-based original was just too polished for its own good. Just a thought, but maybe if there’s an ‘Origins Vol.2’ Frehley should fix the spotlight on the long lost gems in the back of the Kiss closet and breathe some his latter-day magic into those too.